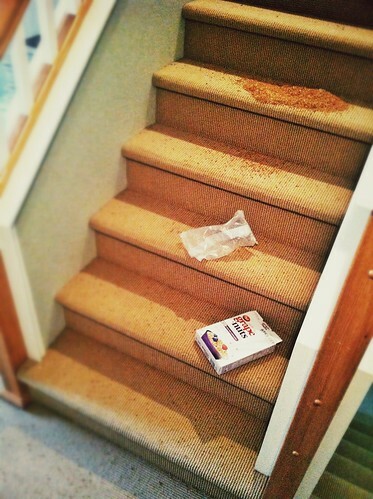 Why yes, that is an entire box of Grape Nuts on my steps, and no, I’m not happy to see you. Why yes, that is an entire box of Grape Nuts on my steps, and no, I’m not happy to see you. – 365, 293, originally uploaded by Fluttering By. This is one of the caveats of having a washer and dryer in the basement. Apparently while I thought I was being all sly and sneaking away while the kids were occupied working independently on their school work, Marcus was all sly and took the almost new (read very full) box and Grape Nuts and proceeded to dump and then throw handfuls of them covering the steps. Please excuse me as I vacuum up the 25 billion (gross underestimate) nuts off my floor. Serves me right for doing laundry.